I like to use Mexican-style Four Cheese Blend when I make this dish. Sharp Cheddar does just as well, or use your favorite cheese blend. Try substituting cream of chicken or cream of mushroom soup to vary the taste of the casserole to compliment your entree. Fry bacon until nicely crisp. Remove from pan and place on rack to drain and cool. After cooling, crumble and set aside. Reserve 2 tablespoons bacon, reserve 1 teaspoon of the bacon drippings. Open soup and place in saucepan. Add milk and heat while stirring until smooth. Remove from heat and set aside. Peel and finely chop onion and set aside. Peel potatoes and thinly slice. A mandolin or slicer works well for this. With a paper towel, spread the reserved bacon grease on bottom and sides of a 8x12x2-inch casserole dish. Ladle soup mixture until bottom of casserole dish is just covered. Arrange slightly over-lapping slices of potato in bottom of casserole to male a layer. Sprinkle on chopped onions, crumbled bacon and some shredded cheese. Repeat layering using remaining potatoes, soup mixture, onions and cheese. Finish with a layer of potatoes and soup mixture. 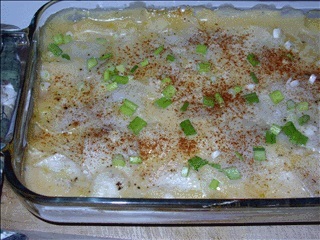 Cover casserole snugly with a sheet of aluminum foil. Bake in a preheated 375'F oven for 15 minutes. Reduce heat to 325'F and bake for an additional 45 minutes. Remove from oven and carefully peel back foil. Test center potatoes with a fork. Return to oven if needed for additional baking time. When center potatoes test done, sprinkle on reserved bacon, shredded cheese and sliced scallions. Return to oven uncovered for five to ten minutes or until cheese is nicely melted and bubbly. Allow to sit 10 minutes before serving.